Nextgen Paid Surveys Review - Is Nextgen Paid Surveys a Scam or Not ? As you probably know Nextgen Paid Surveys is a membership platform where you can find all surveys that you can complete and get paid. Hello everyone, Milan Chymcak. Before I will try to give you my honest Nextgen Paid Surveys review, I have to tell you what you can expect and what’s all inside this membership platform. Nextgen Paid Surveys membership works as middle man between you and some bigger surveys sites. This great, because you will have all surveys together and it will be more easier to manage all your surveys. You will also get updates when you will get invite to new survey. I can’t tell you if you can make thousands of dollars per month, because as I said it depends on your profile information. If you are student, you will get less surveys than 30 years old adult. I can’t tell you or suggest to fake your information to get better survey offers. But I don’t know how they can discover that you are fake person (you just can’t accept group surveys). If I have to tell you if this is great money making program, then no and yes. For me it’s waste of time and it’s boring, but if you need money and you are ok with filling surveys, then you can make additional money to your income. It’s true that all you need is fill surveys in your browser, but fact is that you can’t become rich filling surveys. So if you are expecting $1000s, then you will be disappointed. How much you will recieve (per month) ? Real value of one survey (10-15 minutes to complete) is between $1 – $70. But $70 surveys are very rare (and you will get these money for phone / group surveys). If you are just filling online surveys expect $1 – $10 (you will be very happy for $10). 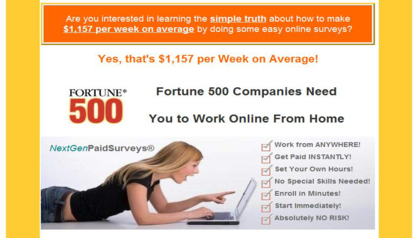 So if you will be able to make 10 surveys per day (2,5 hours), you can make $10 – $100 per day. Otherwise you can try it without any risk, because they have 60 days money back guarantee, so if you are not satisfied with offers, you can request your money. Or if you don’t have enough offers. If you want start making money online, then filling surveys is easiest method that I know. As I mentioned this Nextgen Paid Surveys membership is just middle man between large companies, of course you can apply for free to these companies, but there aren’t any support with surveys and with payments. And finally you will get all surveys together. And if you purchase Nextgen Paid Surveys through us (link is below) I will send you our money making bonuses for free (50 dollars value). These bonuses will try to teach you how to make some money online with different methods. Anyway I hope that you found this Nextgen Paid Surveys review useful and helpful. Is Nextgen Paid Surveys a Scam ?